It is a beautiful Monday in Charleston and all sorts of things are happening in Cannonborough-Elliotborough and the rest of the Charleston Peninsula. Here is a photo by photo account of what I observed this morning while running errands. While showing my listing at 80 Cannon St this morning, I noticed a survey crew at work next door at 82 Cannon St. I am excited to see this house close as it is a real example of demolition by neglect and by poor methods of “renovation”. 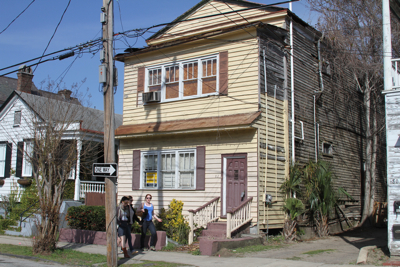 It will be fantastic to see both of these houses at the intersection of Cannon and Smith Street in downtown Charleston South Carolina get the treatment they deserve. This street has been like dominoes lately with all the eye sores being spruced up! Across the street is 79 Cannon, the shabby building was leased out last month to a retail shop. The new tenants have tackled the renovation boldly. 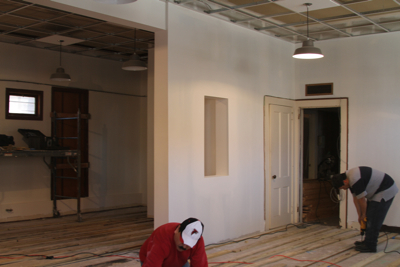 This is a sneak peak as the workers were getting ready to put down the new pine flooring this morning. No more 70’s style dark pine paneling here! 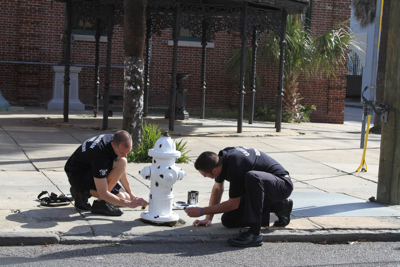 Firemen on Meeting St painting their hydrant to match their dog! I couldn’t resist snapping this photo of the firemen at the Meeting St Fire House this morning painting their hydrant to match their dalmatian. Not really real estate related, but I thought it was a nice way to start the week.